Happy Tuesday church family! It's a busy time of year, and there is a lot going on around Sound City, as well as much to celebrate! Here’s what you need to know for this week and the upcoming season. 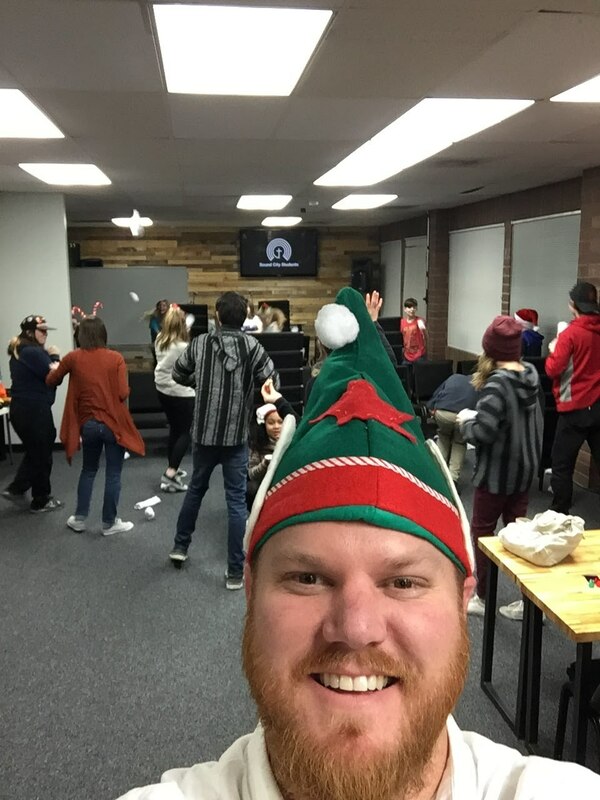 This past Wednesday night the students and Student Ministry leaders gathered for their annual Christmas party in celebration of Jesus' birthday, but they did so for a cause. As part of their Christmas party, for the second year in a row, the students brought packages of new socks along with them for the epic "sock snowball fight" that soon ensued. While there was tons of fun had by all, there was also a missional purpose behind the fun and games. After the "snowball fight," the socks were gathered up afterwards to be given to those in need within our communities. The students and leaders also took time to pray for those who will be receiving these socks. Join us this week in thanksgiving and prayer for the Student Ministry of our church, the amazing and faithful leaders, the students themselves, and for those receiving the simple gift of new socks this Christmas. Last Sunday (12/17) marked the due date for the return of all Giving Tree ornaments and gift cards, so that we could get those gifts to our Giving Tree partners in time for Christmas. But if you missed that date, you can still turn those in at the church offices this week. If you have other questions, or to make alternate arrangements to get your ornaments and gift cards turned in, you can email Michael Eller. When the angels announced the birth of Jesus to the shepherds, they said that their announcement was "good news of great joy" (Luke 2:10). This Sunday, we'll be in the fourth and final week of our Advent with Friends sermon series, and we're wrapping up the series by looking at the theme of joy. So come join us Christmas Eve day—this Sunday—as we joyfully celebrate our Lord's first advent together. For the full Advent With Friends series, click the image below. You—the Sound City Bible Church family—have been always been a generous bunch. Through your giving, God has allowed us to help church members in need, to support the various ministries of the church, to support new church plants and church planters, and so much more. Thank you for your faithful generosity and partnership in the work of the gospel! As we near the end of of the year, we want to invite you to consider making a contribution above and beyond your regular tithe or offering so that we can end the year well financially. We recently put together a video blog explaining more about year end giving, the financial needs of the church, and the opportunities before us in the new year. Check out that blog post, then head to scbc.do/give to utilize our new online giving tool! During the holiday season, our schedule always looks a little different. Here's the important dates to remember for Student Ministry between now and the end of the year. This year, Christmas Eve falls on a Sunday. So instead of doing evening services, this year we'll be hosting three morning services on Christmas Eve: 8:00am, 9:45am, and 11:30am. Kids Ministry will be available in all three services for children ages four and under, with the older kids joining in the main services with their parents. So mark your calendars now for Christmas Eve morning, and join us as we celebrate the birth of our Lord together. Oh, also, for those who can, please attend the 8am or 11:30am service if you aren't planning to bring guests along. The 9:45 service has historically been the most popular for newcomers and visitors and we want to make sure there is plenty of space for them to feel right at home. Several times each year we have the joy of partnering with parents, and our whole church family, in praying for and in dedicating the new babies and younger children of our church to God. To register your child and be part of this special time during any of our three Sunday services on Christmas Eve Day complete the registration form now. For most people in our culture, New Year’s Eve is a time of celebration, partying, and looking forward to the future. For Christians, we always have good reason to celebrate, because we have a resurrected Savior! This year, we are doing something special for our two morning services on December 31: an extended time of singing, worship, and prayer. We’ll have lots of Scripture readings, times of prayer, a celebration of the Lord’s Table, yet no formal sermon. Join us at either 9am or 11am on New Year’s Eve for this special time of worship and praise! JANUARY 7, SPECIAL SERVICE | HAPPY BIRTHDAY SOUND CITY BIBLE CHURCH! On January 7, we celebrate our third birthday as a church! And as we like to do on the first Sunday of each year, we will take time to look back over the previous year in thanksgiving for God’s faithfulness, and to prayerfully look ahead to what God is calling us into in the new year. So come and join us on Sunday, January 7, at 9am or 11am, for cupcakes, celebration, testimonies, and a special message from the Book of Colossians, chapter 1. If you're not currently part of a Community Group, come join us Sunday, January 7, for the 2018 kickoff of our Connect Group! It will be from 3pm–5pm at our church offices in Lynnwood. The Connect Group is our temporary-by-design Community Group that has as its primary goal: helping all who come to find the best possible long-term Community Group fit. It’s also a place to where you’ll meet new people, learn about biblical community, and experience it as well. Go to scbc.do/connectgroup for more information or to sign up to attend (and register for childcare) use the button below. In keeping with our Advent series themes, here's another video resource from our friends at The Bible Project, to reinforce the biblical truths we will cover this Sunday—the Advent theme of Joy. One practical way for you to get connected at Sound City is to prayerfully consider signing up to serve God and his people on a regular basis. Serving is one of the very best ways to build new friendships, get involved, and use your God-given gifts and talents to glorify God and serve his people. For more information about available opportunities, use the link below to sign up with a service team or two, just in time to be a big help to your church family as we start the new year together.